Todd Schneider is deputy division chief, Gee Hee Hong is an economist, and Anh Van Le is a research assistant, in the IMF’s Asia and Pacific Department. WASHNGTON DC, Jul 13 2018 (IPS) - While automation will eliminate very few occupations entirely in the coming decades, it is likely to have an impact on portions of almost all jobs to some degree—depending on the type of work and the tasks involved. Set to move beyond routine and repetitive manufacturing activities, automation has the potential to appear in a much broader range of activities than seen until now, and to redefine human labor and work style in services and other sectors. In Japan, the rapid decline in the labor force and the limited influx of immigrants create a powerful incentive for automation, which makes the country a particularly useful laboratory for the study of the future landscape of work. Japan’s estimated population fell by a record-breaking 264,000 people in 2017. Currently, deaths outnumber births by an average of 1,000 people a day. The Tohoku region in northern Japan, for example, now has fewer inhabitants than it did in 1950. Japan’s birth rate has long been significantly below the 2.1 births a woman needed to sustain growth—it currently stands at about 1.4 births a woman—and unlike for many other advanced economies, immigration is not sufficient to fill the gap. Nearly a third of Japanese citizens were older than 65 in 2015—research from the National Institute of Population and Social Security Research suggests that number will rise to nearly 40 percent by 2050. 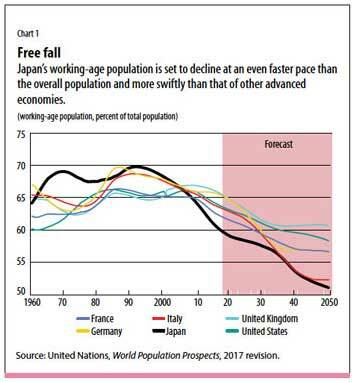 The Population Division of the UN Department of Economic and Social Affairs released an estimate for Japan that showed the country’s population will dip below 100 million shortly after the middle of the 21st century. By the century’s end, Japan stands to lose 34 percent of its current population. Japan is no stranger to coping with limited resources—including labor—and has historically been a leader in technological development. Automation and robotics, either to replace or enhance human labor, are familiar concepts in Japanese society. 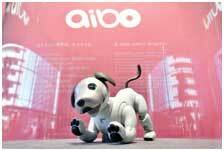 Japanese companies have traditionally been at the forefront in robotic technology. Firms such as FANUC, Kawasaki Heavy Industries, Sony, and the Yaskawa Electric Corporation led the way in robotic development during Japan’s economic rise. Automation and the integration of robotic technology into industrial production have also been an integral part of Japan’s postwar economic success. Kawasaki Robotics started commercial production of industrial robots over 40 years ago. About 700,000 industrial robots were used worldwide in 1995, 500,000 of them in Japan. Japan is still a leader in robot production and industrial use. The country exported some $1.6 billion worth of industrial robots in 2016—more than the next five biggest exporters (Germany, France, Italy, United States, South Korea) combined. 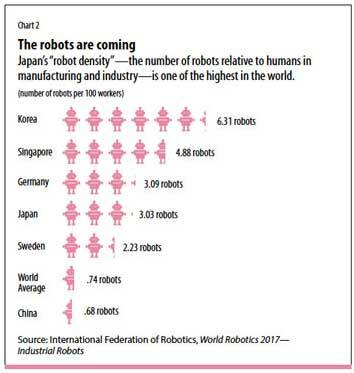 Japan is also one of the most robot-integrated economies in the world in terms of “robot density”—measured as the number of robots relative to humans in manufacturing and industry. Japan led the world in this measure until 2009, when Korea’s use of industrial robots surged and Japan’s industrial production increasingly moved abroad (see Chart 2). First, the gap in productivity growth between the manufacturing and services sectors in Japan is extremely wide. While there are many causes, the largest gains in industrial productivity have been closely correlated with increased use of information and communication technology and automation. Perhaps it is no coincidence that the most productive manufacturing sectors in Japan—automotive and electronics—are the ones whose production processes are heavily reliant on automation. By contrast, the services sector, which accounts for 75 percent of GDP, has seen little annual productivity growth—only about half that of the United States. Labor productivity has roughly tripled since 1970 in manufacturing, but improved by only about 25 percent in the nonmanufacturing sector. The coming wave of automation technology and artificial intelligence promises new possibilities for replacing or augmenting labor in the nonmanufacturing sector (for example, in transportation, communications, retail services, storage, and others). According to several government reports (including the Bank of Japan’s Regional Economic Report and the annual survey on planned capital spending by the Development Bank of Japan), even small and medium-sized firms are embracing new technology to compensate for scarce labor and stay competitive. For example, Family Mart, a Japanese retail convenience store chain, is accelerating implementation of self-checkout registers, while the restaurant group Colowide and many other restaurant operators have installed touch-screen order terminals to streamline operations and reduce the need for staff. Other examples abound in health care, financial, transportation, and other services—including robot chefs and hotel staff. Second, empirical evidence suggests that—contrary to fears for the worst—automation and increased use of robotics have had an overall positive impact on domestic employment and income growth. IMF staff calculations—based on an approach pioneered by Acemoglu and Restrepo (2017) using prefectural level data from Japan—found increased robot density in manufacturing to be associated not only with greater productivity, but also with local gains in employment and wages. Notably, these findings—which exclude crisis periods—are the opposite of results of a similar exercise based on US data. It appears that Japan’s experience may differ significantly from that of other advanced economies. Declining quality of services: Surveys support the view that both the volume and quality of services in Japan are in decline. Recent work by the research arm of Japan’s Research Institute of Economy, Trade and Industry (Morikawa 2018) shows that the quality of services is eroding as a result of labor shortages. Most critically affected are parcel delivery services, hospitals, restaurants, elementary and high schools, convenience stores, and government services. These same factors may explain why—in model- based simulations—Japan could experience higher and more immediate gains from the continued advance of robotics and artificial intelligence in the economy. Looking at data across the Group of 20 industrialized countries, a simulation prepared by the IMF staff points to the risk of declining labor shares, income polarization, and rising inequality. This assumes substantial transition costs (unemployment, lower wages) as increasing automation substitutes for and displaces existing human labor. However, applying this same approach only to Japan yields some very different results. Specifically, with a shrinking labor force, even fully substitutable automation could boost wages and economic growth. In other words, with labor literally disappearing and dim prospects for relief through higher immigration, automation and robotics can fill the labor gap and result in higher output and greater income rather than replacement of the human workforce. These positive results notwithstanding, Japan is not immune from societal and welfare risks linked to increased automation. Polarization of the labor force, in which a relatively small proportion of workers have the training and education needed to fully leverage productivity from robotics, is always a social risk. Research suggests that the female labor force, which has swelled in the past five years, is particularly vulnerable to displacement, given the heavy concentration of women in nonregular jobs (that is, temporary, part-time, or other positions outside the mainstream of Japan’s lifetime employment system), whose tasks are more susceptible to automation (Hamaguchi and Kondo 2017). There is no crystal ball that can accurately predict how fast and how far robotics and artificial intelligence will advance in the next few decades. Nor is there perfect foresight with regard to how these technologies will be adapted to substitute for human labor— particularly in sectors outside of manufacturing. Aside from the nontrivial technological challenges, there are a range of hurdles related to supporting infrastructure— including the legal framework for the use of such technologies alongside the general population— that will need to be worked out. Key issues could include consumer protection, data protection, intellectual property, and commercial contracting. But the wave of change is clearly coming and will affect virtually all professions in one way or another. Japan is a relatively unique case. Given the population and labor force dynamics, the net benefits from increased automation have been high and could be even higher, and such technology may offer a partial solution to the challenge of supporting long-term productivity and economic growth. Japan’s experience could hold valuable lessons for such countries as China and Korea, which will face similar demographic trends in the future, and for Europe’s advanced economies. For policymakers, the first hurdle is to accept that change is coming. The steam engine was likely just as disconcerting, but it came nonetheless—putting an end to some jobs but generating many new ones as well. Artificial intelligence, robotics, and automation have the potential to make just as big a change, and the second hurdle may be to find ways to help the public prepare for and leverage this transformation to make lives better and incomes higher. Strong and effective social safety nets will be crucial, since disruption of some traditional labor and social contracts seems inevitable. But education and skills development will also be necessary to enable more people to take advantage of jobs in a high-tech world. And in Japan’s case, this also means a stronger effort to bring greater equality into the labor force—between men and women, between regular and nonregular employees, and even across regions—so that the benefits and risks of automation can be more equally shared.